The Netherlands’ Waylon has released an official live promotional video and travelled to Portugal to film his introductary postcard. It’s all just the routine work of Eurovision participants: releasing official promotional material, shooting music video’s and filming their ESC postcards. Waylon from the Netherlands is no exception: besides presenting a live performance of his Eurovision 2018 entry Outlaw in ’em as official promo video, the artist also travelled to beautiful Portugal and filmed his postcard at the historic Castelo de São Jorge. In accordance with his rebellious nature, Waylon and broadcaster AVROTROS presented a live registration of his entry as the official music video, at least for now. The performance was filmed on Saturday 3 March 2018 at Poppodium De Vorstin in Hilversum during the public presentation of Outlaw in ’em, broadcast live in the programme Muziekcafé (Music Café) on NPO Radio 2. Waylon filmed his official introductary postcard at the medieval Moorish castle, Castelo de São Jorge, or Saint George’s Castle, in the centre of Lisbon. Built on a hilltop overlooking Portugal’s bustling capital and the Tagus River, the emblematic castle has had a turbulent history – very fitting for the little outlaw in Waylon. Today, the picturesque fortification is a National Monument owned by the Portuguese Republic, and protected as a cultural heritage site. 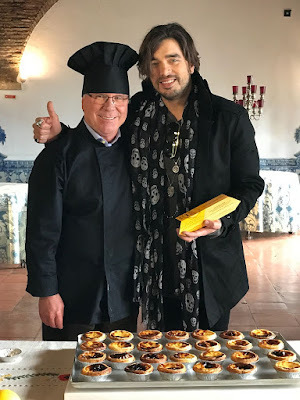 Besides visiting the battlements, Waylon was also treated to a special experience: in a restaurant located in the castle, he helped with the production of typically Portuguese sweets, pastries filled with cream aka Pasteis de nata – because even an outlaw has a sweet side! Waylon’s postcard at the Castelo de São Jorge will feature just before his performance in the first half of Semi-Final 2 on Thursday 10 May 2018. Greece: Official video clip for Oniro mou premieres!